Solstice is designed to leverage existing WiFi/Ethernet networks to support wireless collaboration in meeting rooms and learning spaces. Solstice can be configured flexibly to meet the requirements of your IT security policy and network topology. Deployment options range from deploying Solstice on a single, “flat” network to support for complex networks with multiple VLANs, subnets, and even secure dual-network deployment across segregated primary and guest networks. Solstice communicates via TCP/IP over three configurable ports and is managed as standard traffic, which can be optionally encrypted via RSA/SHA cipher with a 2048-bit private if required. The Solstice Pod is a turnkey hardware console with integrated Solstice collaboration software. Solstice Display Software for Windows is available as an alternative to the Solstice Pod when an in-room Windows PC exists that drives the main room display. For the purposes of this Network Deployment Guide, the term “Solstice host” will be used to refer to the Solstice Pod and/or a Solstice Display Software instance. Although Solstice has been optimized for high performance across a broad range of network conditions, Solstice supports live video streaming over the host network. The host network should meet the minimum requirements shown below. These statistics are to be measured between a Solstice host and end user device for two common use cases. When Solstice is deployed on an existing network, the Solstice hosts and user devices require a wired or wireless network connection with a minimum bandwidth of 20 Mbps. If your network does not meet these requirements you may want to revise routing tables, add or modify a VLAN, or add additional wireless access point coverage. There are many factors that affect network performance, so the numbers above should only be used as a baseline. The best way to understand Solstice performance on your network is to download a free software trial or request a Solstice Pod demo unit and test it out. Solstice has been deployed by some of the top financial institutions and government agencies in the world and is designed from the ground up to be inherently secure. For security-sensitive organizations and environments, we recommend you review our Baseline Security Standard before beginning your deployment. In order to allow collaborators to wirelessly connect and share content to the meeting room display, the Solstice host must be attached to the WiFi/Ethernet network in the room via the built-in standard network interface cards (NICs). The Solstice Pod’s wireless and Ethernet NICs are enabled and configured independently using separate routing tables which provides a range of network deployment options. Solstice Display Software instances inherit the network connectivity of the Windows PC on which the software is installed. Beyond selecting a network mode, there are other setup, configuration, and customization steps that should be completed to ensure a successful deployment. For more information about the deployment steps and options, please refer to the following section in this guide. DirectX 11 graphics (or better). Here’s how to check your DirectX version. Create firewall exceptions as needed to allow Solstice traffic. Refer to the Master Ports Diagram. Connect the Solstice host to power and the room display. Verify that Solstice Pods will be able operate within an ambient temperature range of 0° C (32° F) to 35° C (95° F) based on their physical location. Maintaining this range may require ventilation or active airflow. Solstice Pods should never be stacked on top of each other. Attach the Solstice host to the WiFi/Ethernet networks that participants will use to connect to the Solstice display. Use the host’s configuration panel or the Solstice Dashboard (requires Enterprise Edition hosts) to configure network settings. To allow users to see Solstice displays on the network available for connection, Solstice discovery must be enabled. Once all other steps are complete, we suggest you test end-user capabilities in order to verify the deployment configuration is successful. Your Solstice hosts should be attached to the WiFi/Ethernet networks that meeting participants will use to access your Solstice displays. Solstice can be deployed in a range of network modes based on the network capabilities of the Solstice hosts and configured to meet the requirements of your IT security policy and network topology. Network settings can be accessed and configured under the Network tab of the local configuration panel or via the Solstice Dashboard (requires Solstice hosts to have Enterprise Edition licenses). Wireless Network Card – The Pod’s wireless network card allows the unit to be attached to an existing network as a wireless client. This is valuable when there is no Ethernet jack in the room or when the Pod is deployed in dual-network mode to provide secure access/collaboration for users across primary and guest networks. Wireless Access Point (WAP) Capability – The Pod’s wireless network card can also be configured to act as a wireless access point, creating a wireless collaboration hotspot. When deployed in WAP mode, users can connect to the Pod’s SSID, which will be visible on the display. The hotspot network can be password protected or left open. For performance reasons, Mersive does not recommend use of WAP mode when more than 2-3 people need to connect and share content at a time. Solstice Display Software instances inherit the network connectivity/access of the Windows PC on which the software is installed. This can provide access to single or multiple networks depending on the network capabilities and access of the Windows host PC. The Solstice Pod’s dual-network mode is a popular deployment configuration that provides supports for secure collaboration among users on segregated primary and guest networks. In this mode, the Pod is attached via Ethernet to the primary network and wirelessly to the guest network. Since the two network cards use separate routing tables, no traffic passes between the two networks. In addition to configuring your network settings, you should also give your Solstice displays intuitive names via the hosts’ configuration panels or the Solstice Dashboard (requires Enterprise Edition hosts). Solstice displays are usually named based on their room or location. Additional customization options and other settings can be configured as well. For full details, refer to the Pod Admin Guide, Solstice Windows Software Guide, and Dashboard Admin Guide. Solstice uses all TCP/IP standard network traffic to communicate across all the required and optional components of the Solstice system. Network ports/routes must be open for Solstice to work correctly. The full list of Solstice network ports used can be found in the diagram below. The Solstice Pod supports mirroring for iOS devices with AirPlay® functionality (iOS 6 and higher). Mirroring is achieved through the device’s native AirPlay® feature. You can allow iOS users to mirror their devices to the Solstice Display with some network configuration. There are two network setup options that will enable mirroring with AirPlay® on the network. For networks that allow UDP multicast traffic and Apple’s Bonjour protocol, mirroring should be accomplished using Setup 1 below. For networks that do not allow UDP multicast traffic and/or Apple’s Bonjour protocol, follow the steps for Setup 2 below. Enable iOS mirroring with Bonjour®. The Bonjour® protocol is required. Bonjour® is a multi-cast protocol developed by Apple for device discovery. Bonjour® is packaged with the Solstice Pod, so no separate Bonjour® install is required. NOTE: Bonjour®, as a multicast technology, uses broadcast packets across the network. Bonjour® packets typically will not cross subnets or VLANs. Create network firewall/antivirus exceptions for Bonjour® traffic as needed.Network firewall and antivirus system exceptions must be created to allow Bonjour® traffic through to the Solstice Pod. NOTE: The multicast port Bonjour® uses is UDP 5353. There are several wireless technologies designed to minimize network impact of traffic from multicast technologies like Bonjour®, including Aruba Airgroup, Cisco Bonjour Gateway, etc. Refer to the specific manufacturers for more information. Enable iOS mirroring when Bonjour® and/or multicast traffic is not allowed. Enable AirPlay® Proxy Discovery. The ‘Enable AirPlay Proxy Discovery’ feature should be enabled in the Solstice Configuration Panel or Solstice Dashboard for Enterprise Edition (on the Display tab or Appearance and Usage tab). Create network firewall/antivirus exceptions and open network ports to allow AirPlay® traffic. In order to enable iOS mirroring, AirPlay® traffic must be allowed on the network – by opening the network ports required for AirPlay® protocols – as well as through any network firewalls and/or antivirus systems – by creating exceptions. NOTE: Inbound AirPlay® traffic to the Solstice Pod should be allowed on TCP 6000-7000, 7100, 47000, and 47010, as well as UDP 6000-7000 and 7011. AirPlay® traffic inbound to the Solstice client devices on TCP 7001 should also be allowed. Not all deployments and configurations will require all of these ports/routes to be open. If you need assistance or have questions about setting up iOS mirroring, please contact Mersive Support. For more information about the Solstice Multi-Room feature, please see the Multi-Room User Guide. Step 1: Enable Miracast using the Solstice Dashboard. Find your Pod’s network configuration in the table below and apply the corresponding configuration in your Solstice Dashboard. On the Network tab, enable Wireless Settings. Select Attached to Existing Network radio button to enable wireless antenna for Miracast discovery and click Apply. Do not attach the network interface to an existing network. This interface will remain idle and will only be used for the Miracast discovery stage. On the Appearance and Usage tab, enable Miracast – Stream video over WiFi Direct and over Existing Network. On the Appearance and Usage tab, enable Miracast – Stream video over Existing Network. Ethernet + Wirelessly Attached to Existing Network On the Appearance and Usage tab, enable Miracast – Stream video over Existing Network. Ethernet + Wireless Access Point Miracast Not Supported. When the Pod is acting as an access point, Miracast discovery cannot operate. Contact Mersive to discuss other options like attaching your Pod to an existing network. Step 2: Select Miracast Operating Mode. Mersive’s implementation of Miracast supports two different modes for how video is routed from the source device to the Solstice Pod. Once you have determined which mode(s) you would like to use, configure them on the Appearance and Usage tab of the Dashboard. Over Existing Network and WiFi Direct (recommended) Win8, Win10, Android Allows Pod to dynamically select best video streaming mode. Most robust device connection and setup configuration. Over Existing Network Windows 10 only Leverages existing network to support larger number of simultaneous Miracast users. All Miracast traffic is subjected to network security and monitoring. WiFi Direct Win8, Win10, Android Good for use cases where one Miracast device will be used at a time. Important Note: Miracast discovery operates over a range of approximately 150-200 feet. Only Pods within this range will be displayed in the Miracast source list on the client device. Screen key support for Miracast connections is available via WiFi Direct only. Screen key mode cannot be enabled when Miracast operates over an existing network. If you require the use of screen key, please ensure that you have enabled the WiFi Direct mode only. Display discovery refers to the ability for a user with network access to ‘discover’ what Solstice displays are available for connection using the Solstice app on their user device. There are several options for enabling display discovery, and your choice will depend on how each Solstice host is deployed, how your network routes traffic, and which ports are available. Although discovery may require some initial configuration, it provides your users with an intuitive and simple method of connecting to displays as they move throughout the enterprise and enables the use of the Solstice Multi-Room feature, which will not work if display discovery is not configured. Solstice Discovery Service (SDS) is a light-weight network application for display discovery, enabling client devices on the network to ‘see’ the Solstice displays available for connection even if broadcast UDP packets are not allowed on the network. SDS provides users the easiest method for display discovery and only requires a simple, one-time setup on the network side. If the SDS location (i.e. IP address) is set on your displays’ configuration settings, when users launch their client from a browser window, that client will also have the SDS location set. This means that once a user gets a client on your network, it will be able to display a list of all displays on the network to connect to. Recommended for: Networks that do not allow UDP broadcast and networks that include switches or multiple subnets. How to Set Up: Follow the instructions in the SDS Guide. NOTE: Solstice Discovery Service for display discovery will not function across both networks when using dual network interface cards in a Solstice host PC running Solstice Software. The basic SDS method requires configuration of the host PC’s IP address. To avoid configuring the IP address and to allow users to see available displays without entering any information into their client, you can add a DNS entry to resolve the SDS host IP address to its URL. Recommended for: Networks with switches and/or multiple subnets. 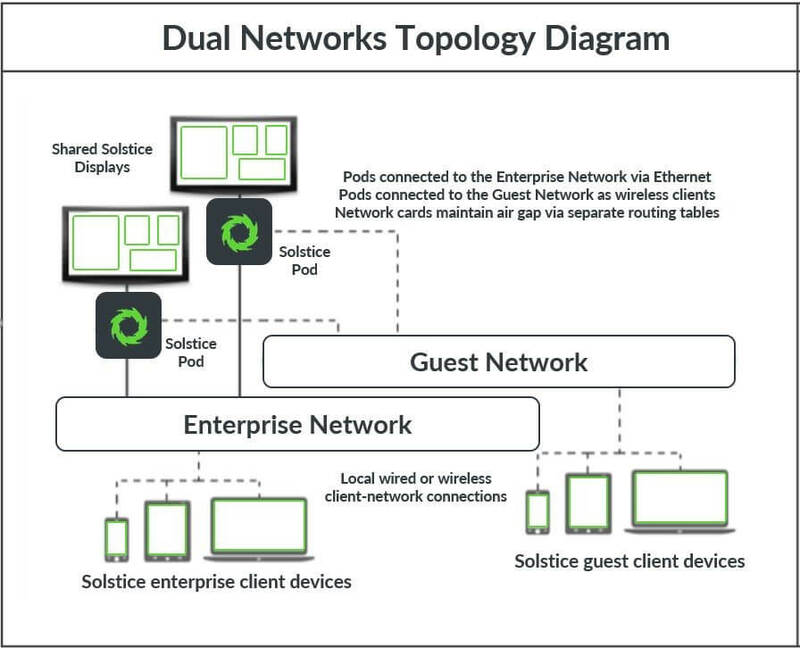 Solstice collaborators with different network access. Users are not required to enter an IP address to connect. Solstice can utilize UDP broadcast packets to automatically populate client devices with a list of Solstice displays on the network to connect to. Broadcast discovery is enabled by default when the Solstice Pod is deployed off-network in WAP mode. Recommended for: Dedicated network configurations and small single network configurations that do not use a switch. Users will not be required to enter an IP address to connect. How to Set Up: Enable UDP broadcast discovery for the Solstice display by checking the ‘Broadcast display name on network’ box. This option is available under ‘Display’ in a Pod’s configuration panel, and in the Dashboard for any Enterprise host. Even with no discovery method configured, users will not be able to see and click-to-connect to Solstice displays, nor will the deployment support the Multi-Room capability. However, users can still connect to Solstice displays on the network by entering the display’s IP address into the connect screen of the client device. On the Appearance and Usage tab, select the Show Presence Bar and Presence Bar – IP Addresscheckboxes, then click Apply. This will show the host’s IP address on the display so users can type it into a browser to connect. With no other discovery method in place, we highly recommend displaying the IP address on both the main screen and in the presence bar. If you do not display the IP address on a display without other discovery methods, you must give users the IP address some other way for anyone to be able to use the display. Consider listing all instance IP addresses in a DNS server so that the DNS name (not the IP address) will display in the startup instructions. You can validate the functionality of your deployment by going through the following steps. Connect Devices to Network. Any end user devices you will be using to verify the deployment must be connected to (one of) the same network(s) as the Solstice host. This may mean a Pod’s WAP, an enterprise network, or a guest network. Connect a PC-Based Client using a Web Browser. Open a browser on a Windows or OSX laptop and enter the IP address shown on the welcome screen of a Solstice display. Click the Connect button to download the client application. When launched, the application should automatically connect to the Solstice display. Disconnect from the Solstice display in the Solstice client application. The discovery panel should appear with a list of Solstice displays available for connection. You can click Clear to remove displays from your Most Recently Used list. Test Desktop Sharing of Business Applications.Connect to a Solstice display and share the desktop of your client device in the Solstice client interface. Move windows and content on the client desktop. Open documents and PowerPoint decks. You should see that your desktop is updated live on the Solstice display, and transitions between slides and changes to documents should be immediately visible on the display. Test Desktop Share with Video. (Skip if only using a Pod’s WAP without Internet access). Open a browser while sharing your desktop and play a web video. Do the same with a video you’ve downloaded to your desktop. You should see about 22-30 fps from a 1080p resolution device, depending on its specs. Audio should be synchronized. Share your Android 5.0+ Device Screen. Download the Solstice app from the Play Store to an Android mobile device. Make sure that device is on the network with your Solstice host. Open the Solstice client and tap the Solstice display’s name. Next, select Mirror Screen and make sure the device’s screen appears on the display. Verify iOS Mirroring. Download the Solstice app from the Apple Store and enable iOS mirroring. If your network does not support Apple’s Bonjour protocol for discovery, you’ll need to first connect to the display using the Solstice app. Launch the Solstice app and select the name of the display shown in the list. Once you are connected, swipe up from the bottom of the screen and select AirPlay. You should see the Solstice display name in the AirPlay list. Select the Solstice display’s name and enable mirroring via the toggle button. Your iOS device screen should now be visible on the Solstice display. If you don’t see the Solstice display in your AirPlay list, make sure the ‘Enable AirPlay Discovery Proxy’ feature under ‘Appearance and Usage’ is enabled on your Solstice display and revalidate that your network ports are correctly open. 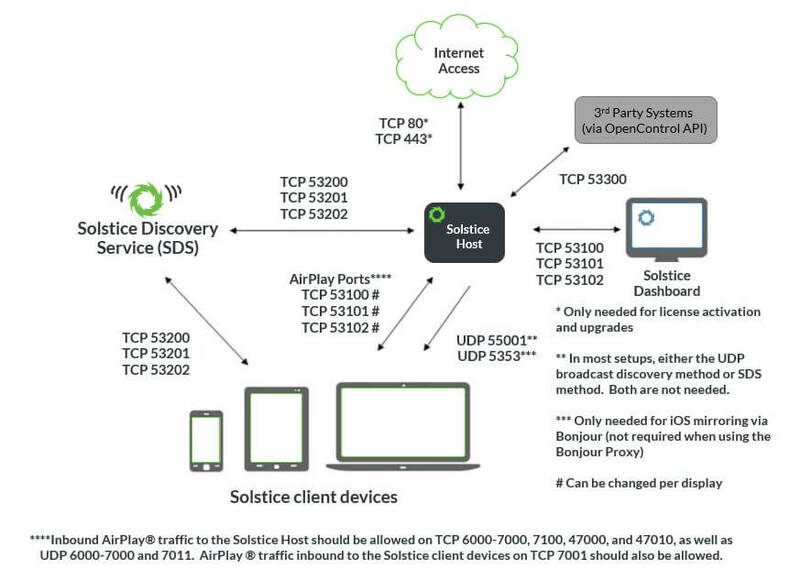 The Solstice AirPlay Discovery Proxy provides an alternative to Bonjour for networks where UDP traffic is disallowed.